We all know that it is not fiscally possible to cut the national deficit/debt without raising someone’s tax bill. I’ll include corporations in my definition of someone, since they are now “persons” with free speech rights. The outlandish and bizarre tax code we currently labor under has been tweaked and pummeled into an unrecognizable amalgam of convoluted provisions, some of them well-meaning, but most not thoroughly or even barely understood by experts, much less by taxpayers. The growing and shameful income and tax inequality in this country is now finally a topic of conversation among policy makers, thanks to the emerging “Occupy” movement. Will this new dialogue impact tax policy? Before the Occupy movement took hold, the showdown staged by Republican politicians over the debt ceiling sent shock waves and uncertainty throughout the financial markets all over the world. Their insistence on cutting the debt/deficit without “raising taxes” was a frightening spectacle, and its premise was not only cynical and dishonest, but completely out of touch with reality. Every single federal budget report by every single expert in the field points to the stark and frightening realities of the budget debt/deficit–we can’t grow out of it, we can’t spend out of it, and we may not even be able to tax our way out of it. It is that bad. I have been waiting for decades for real tax reform. I started my career before the advent of the passive activity rules, which I mark as the beginning of the end for sanity in the world of taxation. While it was important to curb the tax shelter abuses of the early 1980’s, the complexity of the passive activity loss rules opened the door to the idea that, with enough rules, regulations, court cases, and private letter rulings, tax planning can become a game only for the wealthy. Any poor schmuck who can’t afford my fees is doomed. While tax complexity was increasing, the income gap between the super-rich and the rest of the population continued to grow, grow and grow. Then, during the Bush years, the super-rich finally received their blessings from on high. Many multi-millionaires now find themselves in the ZERO percent tax bracket. Also, during this time the Alternative Minimum Tax went out of control and began hitting middle and upper middle income taxpayers. Yet, a family with the just the right mix of tax goodies will have a tax liability that bears no resemblance to another family with the exact same income. Some people say that fairness is subjective. No, it isn’t. Fairness is something that society can agree on, just as we can agree on what is a crime and what isn’t. The current tax system is patently unfair. Hence, it has no moral legitimacy. When this happens, you get the Occupy movement. So, tonight I’ll count pigs flying while I dream about real tax reform. 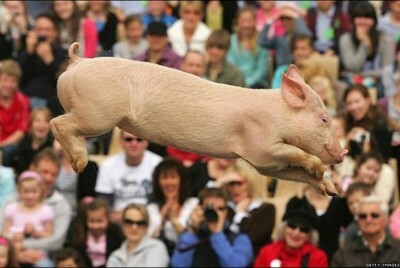 Maybe pigs can fly. It’s nice to know that someone who deals with tax matters on a regular basis share some of my views about tax rates. Good piece.